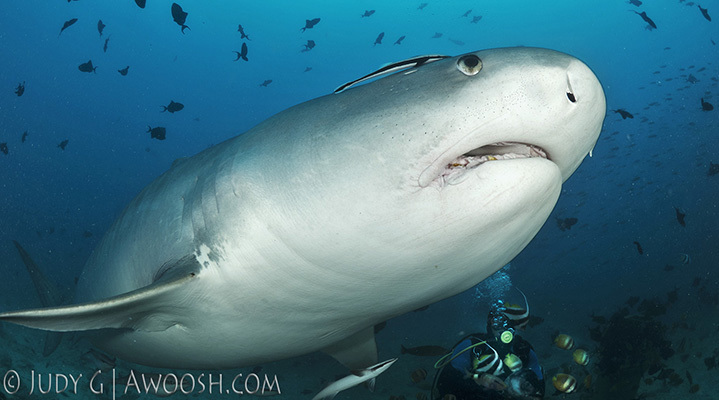 Massive tiger sharks. 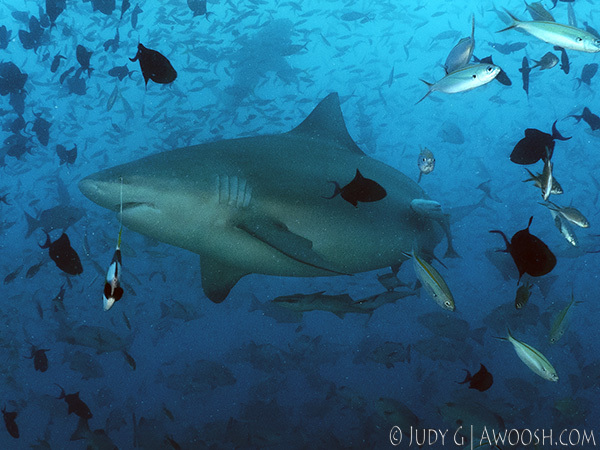 Big beefy bull sharks. Marauding reef sharks. Thick clouds of thousands of fish. Dive masters swimming up into this chaotic melee to dump fish guts in murky mid-water, in an effort to attract the big ‘uns. Twenty-six divers lined up behind a low berm, just feet away from the bait buckets. What could possibly go wrong? I had heard about this dive, operated by Beqa Lagoon Resort’s on-site dive operation, from various sources, including a good friend who had done the dive a few years previously (under different resort and dive op management), and he said it was the bomb, although the tigers did not show for him on his dives there. So we made the effort on our recent trip to Fiji to go to Beqa, although it was a bit of a jaunt from Wananavu Resort on the north end of the big island of Viti Levu. Beqa Island is off the south coast of Viti Levu. The travel to do both involved about four hours on the road, plus a very bumpy one hour slow boat ride to the island. By the time we went back up the west coast to jump on the Nai’a live aboard after our few days at Beqa, we had circumnavigated Viti Levu. 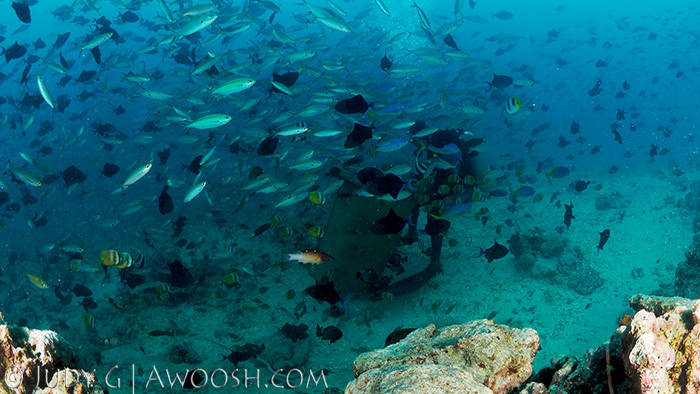 When we arrived at Beqa, we met other divers at the bar who had already done the shark dive earlier in the week. They were pretty excited about the experience, and shared some of their pictures. Honestly, it sounded a bit wild, and having dove in both Galapagos and Cocos Island in Costa Rica, where there are a lot of sharks, I don’t scare very easily. These folks said that when they did the dive, there were not many divers in the water that day, and that seemed to embolden the big sharks. Divers were regularly being bumped by the tiger sharks (and one of them is a pregnant female which is easily 15 feet long! ), and in addition, one of the big tigers followed them up to their safety stop, and was gnawing on one of the mooring lines near the ladder to the boat. Hello. When we planned to go to Beqa, specifically to do the shark dive, Mr G was dubious. He was not sure he wanted to be in the water with big, known-to-bite-humans sharks. I reassured him that people did it all the time, that there had been no reports of trouble, and that we should take advantage of being in Fiji to have the opportunity to do this exciting dive. Selfishly, I was also hoping to get some decent shark shots. As we had mostly been diving in Asia, it had been a long time since I had had the opportunity to photograph sharks – there are worryingly small populations left in Asia, at least in almost all of the locations where we have been diving. As this is my non-commercial blog, and therefore I am not concerned about advertisers nor editors being ticked at me for telling the truth, I am going to be totally honest in my review of the dive operation, and the dive. Yes, there were some great close views of the sharks, but honestly, the whole thing felt slightly out of control, and somewhat unsafe. The resort’s poor management, which trickled down to a poorly managed dive operation, did not instil confidence either. On the day we did the dive, there were 26 diving guests in the water, plus two dive guys who were feeding the sharks, and three or four more, standing on the bottom at widely spaced intervals behind the line up of divers, armed with long metal poles, presumably for “discouraging” sharks that got too close to the people on the berm. The dive plan was for us to swim in a mass group down to the “cathedral”, which is a man made berm of dead coral that has been hand stacked along a ridge, at a depth of about 60 feet, then empty our BC’s and hunker down for the duration. Not far out in front of the berm where I was perched was a big green garbage can with a lid, where the bait (also know as chum) was deposited by the dive guys. On our arrival there was a tornado of fish swirling out in front of us. The visibility was perhaps about 30 murky feet, and beyond that, all you could really see were large moving shadows. Clearly, the local fish are on to the free lunch. 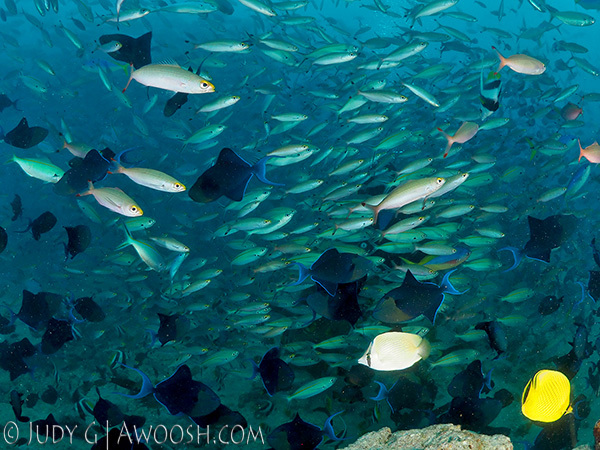 I have never seen so many varieties of fish all swirling together like this. I tried some video, and have a couple of nice clips, but unfortunately I have not got a clue how to resize them adequately so that I can upload them to the blog. The maximum file I can upload here is 4 MB, and even when I exported them for viewing on iPad and iPhone, they are still much too large. I will try to share them on Instagram and Facebook – if you’d like to view them, you can find me at Judy G Diver on both platforms. Peering into the fish soup, I was aware that between the masses of fish, and the poor visibility, I might not see a shark until it was right in front of me. 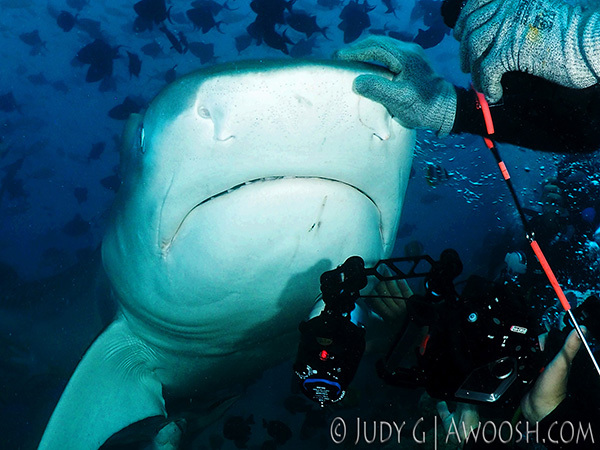 And as it ends up, the closest encounter I had with a Tiger Shark was the first sighting I had – and it was Big Mama. This shark is every bit of 15 feet in length. She sauntered in from out of the gloom, and swam right over my head. I could have touched her easily with my hand as she swam over. Awoosh!!!! Well, that will get your heart started ;^) This huge shark had two remoras (aka shark suckers) along for the ride, one up by its eye, and one just below it. The diver below the shark is one of the dive guys who was positioned out in front of the berm. And just so you know, this was taken with an 8 mm fisheye lens. That shark was maybe two feet from my camera when I took the shot. And then there were more – at least one more slightly smaller Tiger Shark, at least one Bull Shark, some reefies – the party was on. So we stayed for about 50 minutes and watched the show. The sharks swooped in, sometimes turning on a dime to grab a bite or possibly bothered by strobing cameras, sometimes approaching the dive guy at the garbage can for a hand out. At one point one of the big tigers got caught in the line that moors the garbage can to the bottom, and things got a bit hairy for a couple of seconds as she tried to break free. It was exhilarating, but I couldn’t shake the feeling that it could have gone very wrong. After a surface interval of about an hour, we jumped back in to do it again. And herein lies the rub – you need to do this dive on Nitrox. This may be a bit technical for non-divers, but certified divers should know that you can not do two 50 minute dives at 60 feet on air, with a one hour surface interval, without requiring a mandatory deco stop at the end of the second dive. I met another diver at the resort who had done the dive earlier in the week as well. She said in her case, there were quite a few fairly novice divers in a group from the US. When they did the second dive, everyone who was diving air went into deco, and many had no idea what their computers were telling them. Many had ten minutes or more of deco prescribed by their computers, and several did not do the full obligation and then had their computers lock them out for 24 hours. This is crazy. The dive guides need to know who is diving air, and plan the dive to make sure they don’t exceed their bottom time limits. But then, if you have some of the divers on air, and some on nitrox, you will have some people leaving the show part way through, which is when divers appear to be most at risk – that is swimming in mid water during a shark feed. It is an accident waiting to happen I think. So all in all, I can’t state that the shark dive that Beqa is doing, with the current boats, and method, and management, is really all that safe. Don’t get me wrong, we were all exhilarated by the shark dives that we did at Beqa. It was only afterwards that it really began to sink in how dangerous it really was. 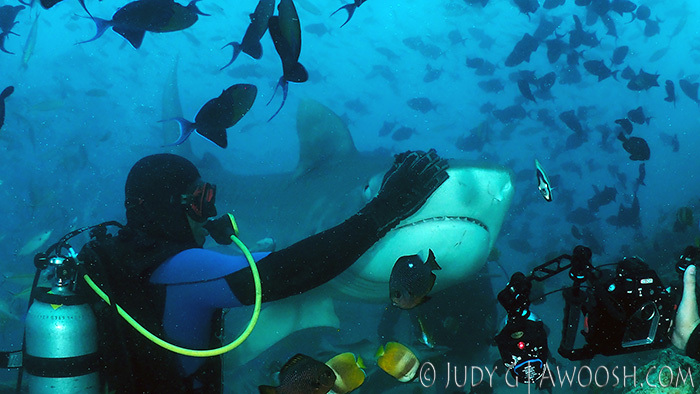 First, there was a photo circulated on Facebook by a diver who did the Beqa shark dive a few weeks after we did. On that dive, one of the big tigers actually swam up to the guy who was hand feeding the sharks, and then put its jaws right over his head. It had his entire head in its mouth! It took a couple of the other guides to help him extricate himself. I am thinking there might have been a soiled wetsuit or two after that excitement ;^). And then, last month, a terrible story out of Cocos Island in Costa Rica, where a female diver was bitten by a tiger shark while doing her safety stop at Manuelita Island. She died from her wounds. The dive master with her, attempting to help her, was also bitten, but did survive. In Cocos, they are not feeding the sharks. There is no chum in the water to excite the sharks and attract them to divers. This was just a really unfortunate, and unusual, incident. I’ve always been a bit dubious about shark feeds. I think it has the potential to create an unnatural food association between sharks and humans. And any time I have been diving on sites where sharks are routinely fed, the shark behaviour is clearly different from non-feeding sites. Unfed sharks tend to be quite shy, and generally avoid divers. Sharks at sites where they have been routinely fed are quite bold, and appear under the boat as soon as it pulls up to the site. Anyway, this is all just my opinion, and experience, offered with some 20/20 hindsight. Others will no doubt defend shark feeding, and the revenue it generates. I just think divers doing these kinds of dives need to be very aware that there may be more of an inherent risk in this kind of activity than we might realize. This entry was posted in All About Scuba Diving, Trip Reports and tagged Beqa Lagoon Resort, Shark Diving, Shark Feeding, Tiger Shark. Bookmark the permalink.